Eventually, you’ll run across a website you don’t want to forget. 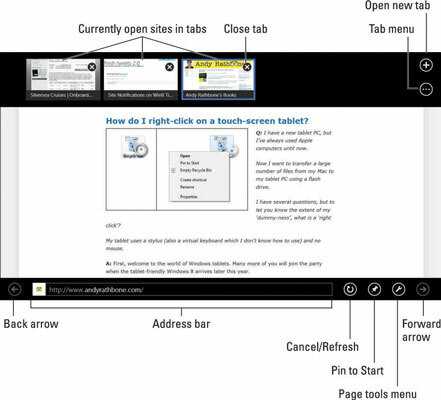 When that happens, “pin” the site to your Windows 8 tablet’s Start screen. Seeing that tile on the Start screen jogs your memory that you haven’t visited for a while, which you can remedy with a tap on the tile. While viewing the site, slide your finger up from the screen’s bottom to see the app menu. The app menu rises from the screen’s bottom. Tap the Pin to Start button. When you want to revisit the site, tap its icon from the Start menu. Or open the browser’s bottom menu and tap the address bar; a list of pinned sites appears above the address bar, enabling you to revisit one with a tap on its name. The Start screen always tacks new items onto its far-right edge.